The cat rescue business has been pretty slow lately. There seems to be some kind of summer slump going on this year. I had only two rescues for the entire month of July, and now, here we are near the end of August, and I have had only three rescues to my credit for the month. I have been moping around the house much of this summer wishing and waiting for the phone to ring and summon me out on another rescue. Well, of course, the call finally did come, but it was after 6:00 on a Friday evening. Hurricane Harvey was approaching the Texas coast and expected to make landfall near midnight. The outer rain bands were just now approaching us here in Baton Rouge, and, while we were not expecting to have to deal with the hurricane itself, we were expecting plenty of rain for the next several days. I had only an hour and a half of daylight left, and I needed some time to get ready and another 25 minutes to drive to the site. 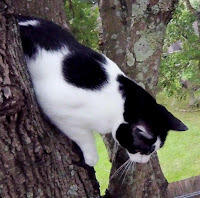 The cat, Pepper, had been in the tree only four hours so far, but I had no idea what to expect from the weather in the morning. I have rescued Pepper twice before, and she is a sweet, cooperative cat, so I knew this rescue should go quickly. She was even in the same tree, so I knew just what to expect. I got ready as quickly as I could and drove over there. Now I felt happy to have some energy in my spirit and not to be moping around the house anymore. 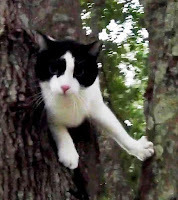 When I arrived, I met Susan and Tom again and spotted their black and white cat, Pepper, in the same tree right away. She was exactly 22 feet high and appeared reasonably comfortable and relaxed. I prepared to set up my climbing rope. As I climbed up to her, Pepper remained relaxed and never moved from her perch. She greeted me with a little sniff and happily let me pet her. If I had been in a better position, I think she would have stepped onto my lap. Instead, since she came down in the carrier twice before, I pulled the carrier up and placed it in front of her. I didn't even bother opening a can of food to use to entice her inside, because I thought she would not need that this time. She peered inside the carrier for a few seconds and then readily walked inside. I closed the door, secured her to my harness, and came on down to the ground where I handed her off to Susan. That was easy. And quick, too. I believe that is one of the fastest rescues I have done. One of the noisiest, too, because of the cicadas in the tree. You will not be able to avoid hearing them in the video.